"Steve Matthews. Great. From initial call for appointment, to delivering the dehumidifier on a separate date, calling days before..."
Both Steve and Jarod were very professional. Jarod arrived on time, and when he left didn't leave any evidence he was there. He explained the new system I had installed and did a real-time demonstration. He explained the battery backup very well as well.Would recommend this company again in a heartbeat. Hi Steve, just wanted to pass on a thank you for the work the guys did. Dave and his crew were awesome, and super-fast. You guys are great thanks again! Good morning Steve, Your team was in yesterday and although we have not yet had a chance to test your new system (we will on Thursday), Julie and I wanted to reach out and tell you how impressed we were by your team. Not only were they thorough with what they did, but also left us with a feeling of "Do it right the first time". They went over and above I am positive of that in the laundry room area. I can't thank you enough for your patience in consulting us and your guidance through this process. As you know we are heading into a just rest of the week with our insurance claim so your timing couldn't have been better. When you have a moment, can you please give Julie a call? We would like to give the team of 2 that came by the house something special but we need your guidance once more. Enjoy your day! Job has been completed & we are soooooooooooooo very satisfied with our installation!!!! As the install was under our stairwell I'm certain it was not the most inviting place to work but, your servicemen did an outstanding job! Installation looks very good & left the work place in perfect condition!! Again, our thanks for a job well done & we will highly recommend your company to our friends. An increasing leak problem in the cold cellar beneath the main house entranceway led to a call to Clarke Basement Systems. From that moment onward, I was treated with complete courtesy and respect. Although I had to wait several weeks for an estimate, the wait was definitely worth it. Steve presented me with a clear overview of the steps necessary to fix the problem. Luke and his crew completed the work in a very professional manner, keeping me informed of the step-by-step process. Two months after the installation was finished, a small leak occurred following a heavy all-day rainfall. My call to the Clarke office was handled by Amber and Rob with complete courtesy and respect. One day later, Luke returned to my house, inspected the problem, and made the necessary repairs to my basement system. The clincher for me is that throughout this entire process I was treated as a respected client. "You get what you pay for" and Clarke Basement Systems certainly gets my recommendation. Clarke Basement Systems was suggested to me by my brother-in-law. When Steve, from Clarke Basement Systems, came out to my house to assess the basement, he was helpful, polite and very patient with all my questions and concerns. He provided a couple of repair options and didn't pressure me to make a decision on the spot, which I appreciated. In the end, I decided to go with installing a Water Guard perimeter waterproofing system with a Thermal Dry Wall membrane on the exterior wall that was leaking. The guys who showed up to install these products, Fitz and Brandon, were also very polite, helpful, and respectful of my house. They explained what exactly they were doing and how it would work. They walked me through every step of the project. The guys showed up on time and used their time efficiently to get the job done. The clean up was great and the imprint of my daughter's hand in the freshly poured cement was a wonderful touch. We've had a heavy rain since the work was done, and so far the basement has remained dry. It is so nice not to have to worry about a wet basement during a summer storm. I would definitely recommend Clarke Basement Systems to family and friends. When water appeared nearly 2 years after the initial repair of the wall and the installation of the interior weeping tile system in our house, we immediately feared the worst, that in some way, some how the system was now compromised.We immediately called the main number and Rob came to investigate in order to determine the cause. He was confident that Clarke's system was not the cause but he was determined to find it and he scheduled another visit this time with Steve (our salesman) who had an infra red camera and it didn't take them both long to determine that the source was a plumbing leak related to the shower. Needless to say we are relieved that the source wasn't related to the Clarke's installation and through the whole discovery process both Rob and Steve were both concerned for our problem and courteous and polite during what started out as a very emotional experience.Rob and Steve's confidence in their product and installation process was once again confirmed, and our experience with their after sales support reaffirms in our minds that we chose the right solution, from the right company with the right people. I called CBS based on reviews from this site. My call was handled very professionally as well as the actual appointment. Steve made me feel at ease right away. It was an easy decision to go with CBS! The installation was completed within the time frame and cost as quoted.That makes me happy and able to recommend CBS. Thanks!. As a single woman in my first home, I was overwhelmed when my basement flooded. From my initial call to Clarke Basement Systems through to the completion of the repairs, I was treated with respect while each step of the project was explained to me. I compared price quotes with other companies and found Clarke's cost to be most reasonable, as well as their staff to be very knowledgable and patient with my questions. Steve explained what the repair would entail and how long it would take. Then when Jarod came to actually do the repairs, he explained it again and invited me to view the project at each step so that I truly and completely understood what was going on...and why the leak would never happen again! Thank you to Jarod and Steve for their professionalism and exceptional service! I would highly recommend this company to anyone looking for a permanent solution to a leaky basement! Using our patented PolyLevel® Injection we lifted this backyard patio slab on grade, 4 inches which prevented the slab from sloping towards the house, it now slopes away from the house. We also decreased the step height from 11 inches to 7 inches. Our customer was pleased that the crack was sealed in a short amount of time and on budget. They can now continue with finishing the basement. This crawlspace was encapsulated with our Cleanspace® Vapour Barrier to keep cold air out, as well as musty smells. CleanSpace® Vapour Barrier, WaterGuard™, and TripleSafe™ Sump Pump were installed to permanently waterproof this basement. This Port Hope, ON basement was waterproofed using our TripleSafe™ Complete Sump Pump System and CleanSpace® Vapour Barrier. A basement in Ajax, ON, had an issue inside the laundry room. Three holes were leaking damaging the finished floor and walls. The main concern was that a tenant was renting out the basement and our customer wanted to make sure the area was a healthy and safe space. Thankfully Clarke Basement Systems was able to provide a permanent solution. Our team injected polyurethane into the holes to seal and prevent water from gaining entry into the laundry room. The area is now dry while being a safe and healthy space. The homeowner of this 60-year-old, block foundation bungalow in Ajax, ON had a fully finished basement that was continually rented out. After a long, harsh winter the Spring thaw began and so did the leaking. The tenants started to notice that one wall, in particular, was water damaged, that a bedroom had water appearing near the wall/floor joint, as well as another area near the stairs. The owner of the house knew they had to do something, or they'd lose their tenant. We went out to meet with the homeowner agreed on a partial interior drainage system, which included a SuperSump® Premier Sump Pump System, WaterGuard® Below-Floor Drain, and ThermalDry® Wall Vapour Barrier. Thanks to these fantastic basement systems, the homeowner and tenants both have a piece of mind and no longer have to worry about unwanted water entry. Our customers were in the middle of finishing their basement to sell their home when the contractor spotted a leak in the foundation. Our customer wanted the crack sealed immediately to stay on schedule with the renovations and retail listing. Our team installed a FlexiSpan® Foundation Crack Repair System that never dries out or breaks since it adapts with the foundation. The customers were thrilled to have a dry, protected basement. They were able to finish renovating the basement and finally put the house up for sale. A home in Markham, Ontario had water flooding in from through the window areas of the basement. The house had improperly installed and outdated window wells. Over time, the frost had lifted these window wells, allowing dirt underneath to clog the vertical drainage in the window well area. The homeowner wanted to ensure this problem met a solution to eliminate basement problems and guarantee window well improvements. The customer called Clarke Basement Systems and Steve Mathews explained the options for a solution. Don and his crew used SunHouse™ window well enclosures to replace the old window wells. Our SunHouse™ Window Wells offer the depth required by the house, a solid bottom to prevent dirt from ever entering the well again and a large, clear, strong lid so leaves and debris would not fall in again. The customer is satisfied that the only thing that will be entering these windows from now on will be the glorious sunshine. A home in Cavan, Ontario, had walls that were cracked and bowed in. The wall was dangerous to the house because with further damage it could ruin the home. The customer wanted this problem fixed as soon as possible to ensure the home would be a safe living space. The customer called Clarke Basement System, and Steve Matthews explained the work that would be done to the home to fix the problem. Jose and the team came in and installed PowerBraces™ to straighten the home wall and to stop it from bowing further. CleanSpace® Vapour Barrier was established to capture any water and moisture brought in through the wall cracks and direct it into the WaterGuard® Below-Floor Drain. The WaterGuard® was installed to push any access water out away from the house allowing the house to be stable and waterproofed. The customer was satisfied because they no longer have to worry about the damage done to the home and they know that the house is waterproofed. This basement floor was sinking, and over time it damaged a fireplace and built-in cabinets due to the gaps. We used PolyLevel® Injection under the basement slab restoring the floor to its original height closing the gaps in all areas including the fireplace and built-in cabinets. ThermalDry® Wall Membrane and WaterGuard® Below-Floor Drainage System will permanently fix water seepage issues. The systems work together to collect and drain water into the sump pump system. This basement is entirely waterproofed and can now safely store the businesses vital records and documents. A homeowner wanted a new egress window installed in order to meet the building requirements for a basement apartment. Now the customer has larger windows that allow the sunlight into the basement for a brighter space. This Nestleton Station, ON basement, had several outdoor waterproofing attempts by many contractors under its belt. The homeowner had spent tens of thousands of dollars. We finally permanently waterproofed the inside using WaterGuard® Below-Floor Drain and ThermalDry® Basement Wall Insulation. 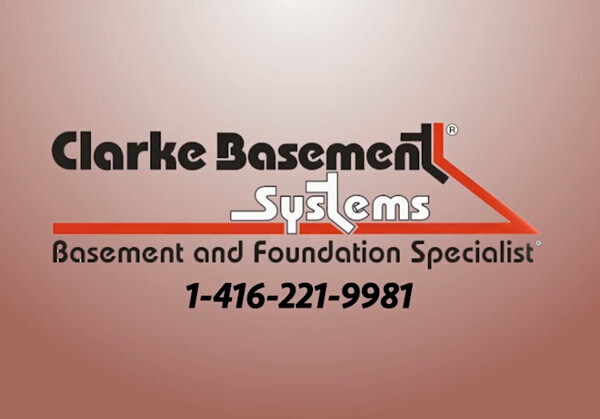 The homeowner had attempted to control the water in his basement himself for many years but eventually realized that calling call Clarke Basement Systems to do the job right would save him time and money in the long run. We waterproofed the basement correctly with our Crack Repair Services to keep the basement dry. A new home in Port Hope, Ontario, was not properly waterproofed when it was built. The customer contacted Clarke Basement Systems and we fixed the problem in one day with our Basement Waterproofing Products! A total cleanup of an investment property in Orono, Ontario. Using our patented products, we were able to give our customer a complete waterproofing system to ensure no future water damage. After constant sump pump failures, we installed a TripleSafe™ Complete Sump Pump System. After being waterproofed, an old damp bench footing got a new lease on life! A first time home buyer found that the wet basement had been covered up! After further inspection the customers finished basement was noticeably damp. We installed our waterproofing systems, and now the customer can renovate their basement without worrying about basement floods! Only one wall stood in the way of finishing this basement. This one wall, in particular, was the root of all the leaking issues. Rather than having to waterproof the whole basement, only one wall needed the help of our systems to stay dry. The result was a fast repair, and a dry basement! This homeowner in Cavan, ON, had a lot of water leakage in their basement. They also had many obstacles to keep in mind during the installation, as many customers basements do. A full waterproofing system including; An internal TrenchDrain™ Basement Entry Surface Drainage was installed around the obstacles keeping the basement dry from any leakage. We also installed ThermalDry® Basement Wall System to keep water and mould out of the basement. Our WaterGuard® Below-Floor Drain was installed around the perimeter of the basement leaving the customer with a clean and dry basement. This Millbrook, ON homeowner, contacted Clarke Basement Systems because her stone foundation was causing may issues. Since it was made of stone, leakage between the stones became a problem for her basement. A wet basement is one of the top concerns of any homeowner! She told us it had already caused so much damage already. We came up with a solution to get her basement dry. We installed a WaterGuard® Below-Floor Drain, a CleanSpace® Vapor Barrier and a SuperSump® Premier Sump Pump System to fix the problem and keep the whole basement dry. N! A home in Pontypool, Ontario, had a crack in the foundation wall that continuously leaked. Clarke Basement Systems was contacted to fix the issue correctly so that the customer no longer had to spend time and money trying to fix it. We gave the customer a permanent solution by using the FlexiSpan® Foundation Crack Repair System that completely stopped leakage. Now the customer no longer has to worry about water damage and has a clean and permanent solution. They were very satisfied with how quick and efficient our team was! A homeowner in Blackstock, Ontario, previously waterproofed from the outside of their home. They learned this other company's systems have no warranty against water entering under the basement floor. When this happens it is called hydrostatic pressure and many basements suffer from it. The customer contacted Clarke Basement Systems to fix this problem- and we include a warranty! We installed a WaterGuard® Below-Floor Drain around the perimeter of the basement to keep out any water leakage. We also installed a SumpPump to keep flooding under control. Lastly, we installed a ThermalDry® Vapour Barrier to seal the basement walls and provide a radiant barrier for heat. Now this customer can relax knowing his newly waterproofed basement has a warranty for years to come! Sometimes waterproofing is not as simple as it seems as in the case of this semi-detached home in Hampton, Ontario. There was Hydrostatic pressure that built up and drove water up through the floor. The customer had many cheap solutions done, but all had failed and there was constant water leakage. The homeowner contacted Clarke Basement Systems to fix the problem permanently. A proper drainage system was installed in the form of a WaterGuard® Below-Floor Drain. A SumpPump® Premier Sump Pump System was installed as well as a CleanSpace® Vapour Barrier along all four walls of the home. Now the homeowner no longer has to worry about water and moisture because we have given them a permanent solution. A home in Bethany, Ontario had water flowing under the foundation wall and into the crawlspace. The homeowner called Clarke Basement Systems to fix the problem before it got worse. We used the CleanSpace® encapsulation along with a new Sump Pump to completely fix the issue. Now the home is dry and healthy! A property owner in Caesarea, Ontario, wanted a quick repair on one leaking wall, that would have little impact on the tenant. They called Clarke Basement Systems to come up with a solution that would stop the leakage quick and easy. We installed the WaterGuard® Below-Floor Drain and CleanSpace® vapour barrier.